There are two common hive manipulations that involve stacking two brood boxes on top of each other – the vertical split and uniting colonies. Should the queenright colony go on the top or bottom when uniting colonies over newspaper? What about when conducting a vertical split? Does it make a difference? In the following discussion I’m assuming the colonies being stacked are originally in single brood boxes. This is so I don’t have to qualify how many boxes are involved every time. For convenience, let’s also assume that you are uniting a queenless and queenright colony, rather than getting into a discussion of the benefits or otherwise of regicide. There are a number of methods to unite (merge) two colonies. The simplest, the most often taught during beginners courses and – in my view – the (almost) foolproof method if you are not in a rush is uniting over newspaper. To unite over newspaper the roof and crownboard from one colony are removed and one or two sheets of newspaper are laid over the top bars of the frames. One or two small holes are made through the newspaper and the second brood box is placed on top. Replace the crownboard and roof. 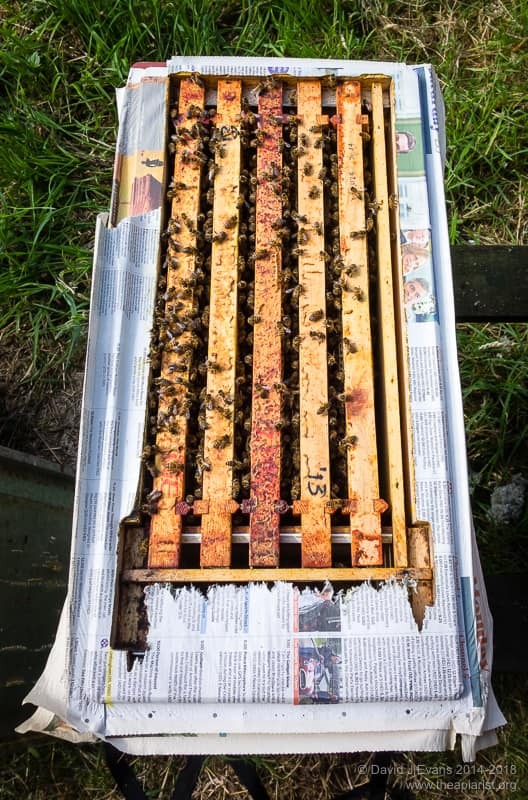 The only precaution that needs to be taken is to ensure there isn’t brace comb on the bottom of the frames of the top box – this would puncture the newspaper and allow the bees to mix too quickly. This is also why I stressed a small hole in the paper. Over the next 24-48 hours the colonies slowly chew holes through the paper, allowing the bees to gradually mix. It’s best not to interfere for a few more days. One week after uniting the frames can be rearranged and the bees cleared down to a single box if needed. What matters and what doesn’t when uniting? The queenright colony should be on the bottom. The weaker colony should go on the top. The colony moved should be at the top. Frankly, I don’t think it makes any difference whether the queen is in the top or bottom box. I’ve done it either way many times and never noticed a difference in success rates (generally very high), or the speed with which shredded newspaper is chucked out of the hive entrance. I think you can safely ignore this bit of advice. I can’t even think of a logical explanation as to why it’s beneficial to have the queen in the bottom box. Can you? After uniting I usually find the queen in the top box a week later. If colonies differ markedly in strength I do try and arrange the top box as the weaker one. 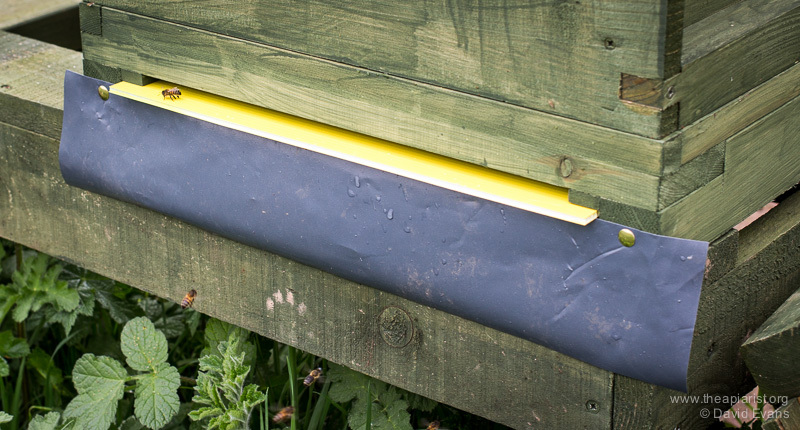 I suspect this is beneficial as it stops the foraging bees from the strong hive trying to get out or return mob-handed, potentially overwhelming the weaker colony. I think it’s also sensible to locate the moved colony at the top of the stack. I think forcing them to negotiate the bottom box encourages the foragers from the moved hive to reorientate to the new hive location. A vertical split is a hive manipulation that can be used as a swarm control strategy or as a means of ‘making increase’ – the beekeeping term for generating a new queenright colony. Whatever the reason, the practicalities are broadly the same and have been described in detail previously. Briefly, the queen and flying bees are separated vertically from the nurse bees and brood in two brood boxes with separate and opposing entrances. As described, the queen is placed in the top box with the split board entrance facing the opposite direction to the original hive entrance. The logic here is that the flying bees are depleted from the queenright half of the colony, so both reducing the swarming impulse and boosting the strength of the half rearing a new queen. 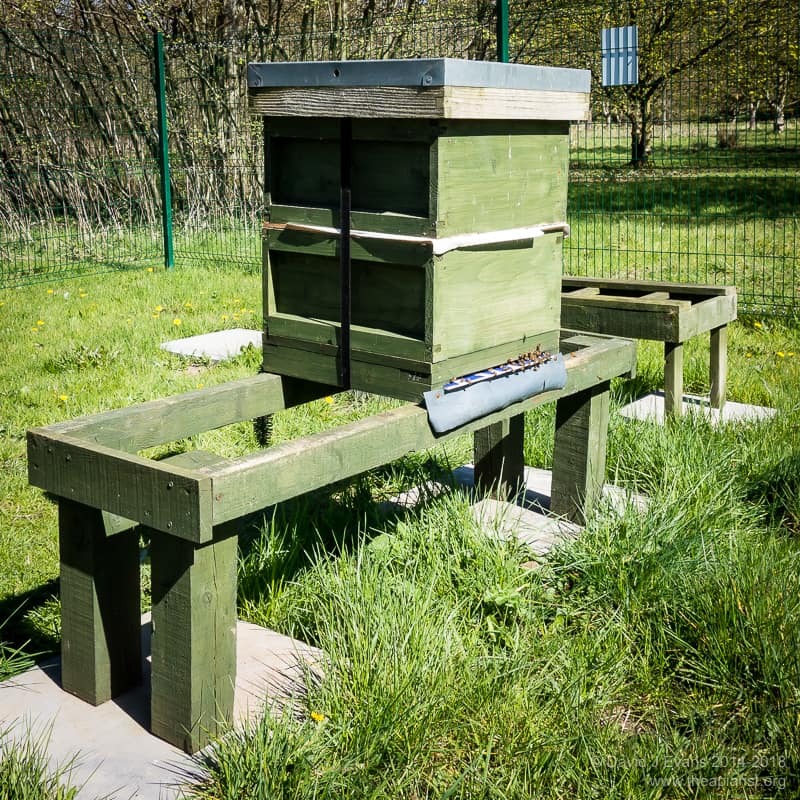 After one week the hive is reversed on the stand – the front becomes the back and the back becomes the front. This results in depletion of flying bees from the queenless half, so reducing the chances of them throwing off a cast should multiple virgin queens emerge. Simultaneously the queenright half is strengthened, boosting its nectar-gathering capabilities. Although I’m an enthusiastic proponent of the vertical split I acknowledge there are some drawbacks to the process. Once there are supers involved things can get pretty heavy. Simply reversing a double brood box can be taxing for some (me included). I’m dabbling with building some floors and split boards with opposing entrances to try and simplify (or at least reduce the strain of) this aspect of the process. A second problem is the need for subsequent inspections of the colonies. 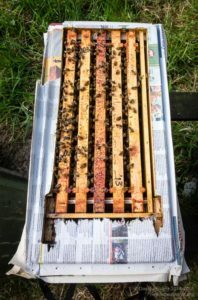 When used for making increase (or for that matter replacing the queen) nothing final can be done with the colonies until the new queen – reared in the bottom box – is mated and laying well. Of course, determining whether she is ‘mated and laying well’ involves splitting the boxes and carefully examining the lower colony. This inspection should probably take place about a month after the initial split (up to 16 days from egg to emerged queen, a week or so for her to get mated and a further week for the laying pattern to be established). Depending on colony strength, weather and the temperament of the colonies, this inspection might have to be conducted in a maelstrom of bees returning to the upper colony (which has had to be removed for the inspection). Perhaps not the most conducive conditions to find, mark and perhaps clip the new queen. During the month that the new queen is being reared and mated there’s probably little or no need to inspect the queenright colony. They have ample laying room if you’ve provided them with drawn comb. 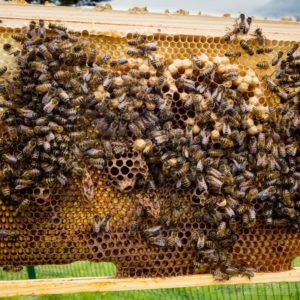 If you gave them foundation only, or foundationless frames, they will likely need thin syrup if there’s a dearth of nectar. If you’re using a standard frame feeder this is a pretty quick and painless process. Under the conditions described above I think it makes relatively little difference whether the original queen is ‘upstairs or downstairs’ at the outset of the split (though see the comments at the end on the entrance). However, having the new queen in the bottom box might dissuade you from inspecting too often or too soon – neither is to be encouraged where a new queen is expected. You can use a version of the vertical split to rear several queen cells. Rather than then reversing the colony and depleting the queenless half of bees you can use it to create a number of 2-3 frame nucs, each populated with a big fat ripe queen cell. In this way you can quickly make increase – trebling, quadrupling or perhaps quintupling the original hive number. The precise details are outside the scope of this article – which is already too long – but Wally Shaw covers it in his usual comprehensive manner (PDF) elsewhere. For this you want to make the initial queenless half to be as strong as possible (to rear good queens). You also want it to be as easy to access as possible to facilitate checking on the development of the new queen cells. Under these conditions I think there’s good reason to start with the original mated queen ‘downstairs’. Remember that at the start of a vertical split, and for a couple of days after, bees will be exiting the rear entrance and returning to the ‘front’ of the hive to which they originally orientated. 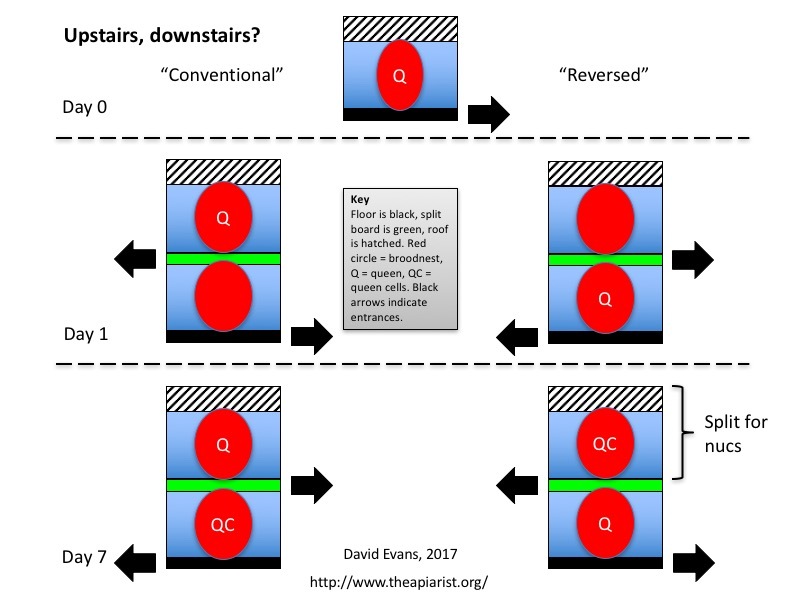 If you decide to leave the original queen in the lower box this will necessitate reversing the hive at the very start of the process, then placing the split board entrance at the hive front. Bees cope well with this vertical relocation of a hive entrance. Sure, there’ll be a bit of milling about and general confusion, but they’ll very quickly adjust to a hive entrance situated about 25cm above the original one. In the original description of the vertical split they had to make precisely this adjustment at the 7 day hive reversal. It helps to try and restrict bees from accessing the underside of the open mesh floor during these hive reversals – for example with a simple plastic skirt (see above right). Bees are pretty adaptable to the sorts of manipulations described above. Yes, there are certainly wrong ways to do things, but while being careful to avoid these, there are several different ways to manipulate the process to achieve the desired goal(s). It’s worth thinking about the goal and the likely behaviour of the bees. Then have a go … what’s the worst that could happen? 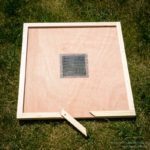 This entry was posted in Beekeeping, Queen rearing, Uniting and tagged making increase, newspaper, queen, split board, uniting, vertical split on April 7, 2017 by David. Was it good for you? … No, not really. I recently posted the weather forecast for the week beginning the 15th of August. 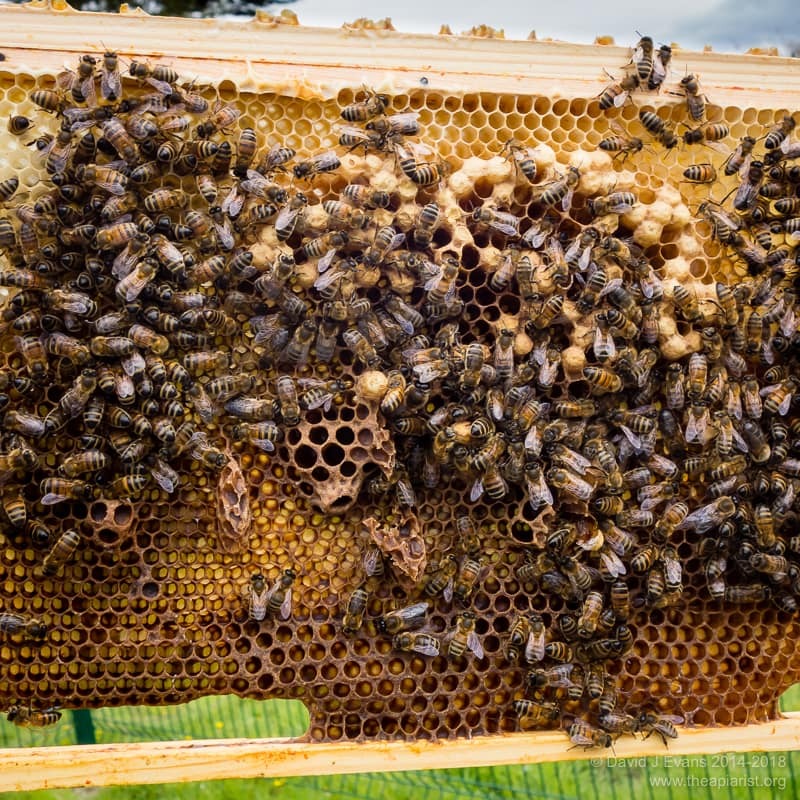 I was pleased that the forecast was for near-perfect queen mating conditions – sunny, warm and calm – as I had three colonies which should have contained virgin queens that were due to emerge a few days before. The forecast was very accurate. Conditions were wonderful. 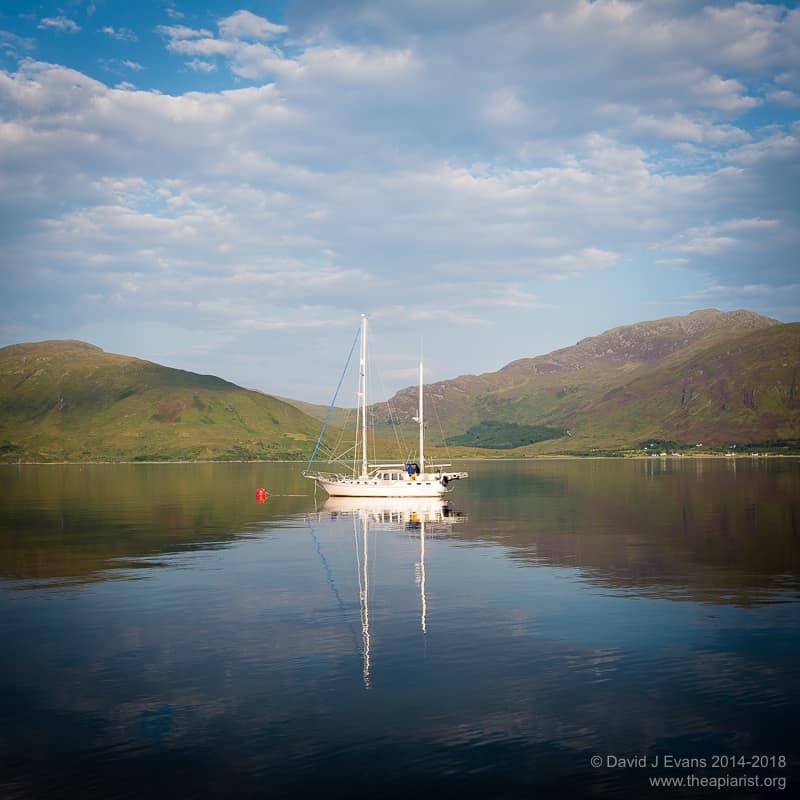 I wasn’t around as I had disappeared to Torridon and Skye for a few days. On checking the colonies at the end of the week after I returned, all three contained queens at least two of which were laying. 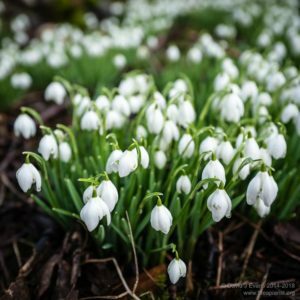 Well, not entirely, because mid-afternoon on the previous Wednesday I’d been sent an email from my friend at the apiary that read … “Incredible roaring noise attracted me outside the workshop – a swarm moving west through the garden and into the trees. All caught on camera”. I didn’t receive the email as I was in the howling wilderness. Not that I could have done much about it. A very quick inspection of the colony in question on my return confirmed that they’d swarmed. D’oh! I’d obviously missed at least one additional queen cell (mistake #1) on the last inspection and a large cast (the queen must have been a virgin as the original queen had been removed from the colony) had disappeared over the fence … mistake #2. There was a queen present but bee numbers were significantly down. I closed the colony up and disappeared on business for a further three weeks … mistake #3. 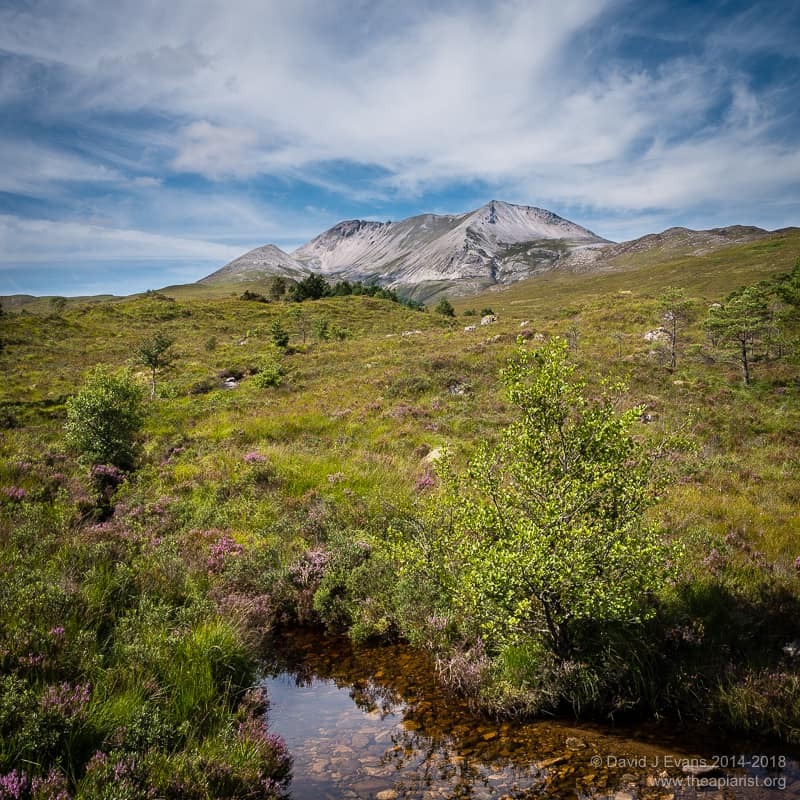 The weather had been great the entire week I was away in Torridon. I suspect the colony swarmed on the Monday or Tuesday, that it hung around in a nearby tree until the Wednesday while the scout bees found somewhere more desirable to relocate to†, and that my friend had seen it leaving the neighbourhood that afternoon. Don’t let the colony decide how many queens should emerge. Instead leave only one known charged (occupied) queen cell to emerge. I’d left an open queen cell on a marked frame, but had not returned a few days later to check that a) it was safely sealed and b) that they hadn’t raised anymore. They had 🙁 Consequently they swarmed when the first queen emerged, leaving one or more additional queens to emerge, fight it out and then head the now much-depleted colony (see 3, below). 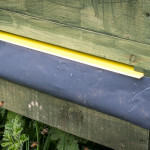 Leave a bait hive in or near the apiary, even if the main period of swarming has passed. I’ve been very successful with bait hives over the years, successfully attracting my own and others’ swarms. In this instance the main swarming period was well-passed and I’d packed away my bait hives until next Spring. Wrong. Had I left one near the apiary I may well have managed to attract the swarm and so a) not lost the bees, and b) not potentially inflicted the bees on someone else. I view bait hives (and queen clipping) as part of being a good neighbour. Don’t leave a weakened colony late in season. On returning from my three week absence for work I discovered the colony had been robbed out and destroyed. Clearly it had been unable to defend itself from robber bees or wasps and had perished. I should have instead made an executive decision on discovering the colony had swarmed and probably sacrificed the virgin queen and united the weakened colony with a strong colony nearby. In retrospect this was an obvious thing to do … the colony was weak, wasps were beginning to be a problem, there was little or no nectar coming in and the weather was uncertain. As it turned out the weather was good enough for queen mating while I was away. However, the combination of a dearth of nectar, a weakened colony and strong neighbouring colonies meant that robbing was inevitable and – for the colony in question – catastrophic. † If you’ve not read Tom Seeley’s outstanding Honeybee democracy about how a swarm decides where to relocate to you should. 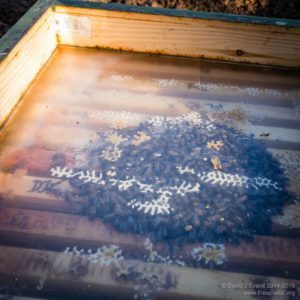 This entry was posted in Beekeeping, Seasonal, Swarms and tagged autumn, forage, lessons, nectar, queen, robbing, uniting on September 10, 2016 by David. I conducted my first inspections of colonies outside the bee shed last week. One colony that had looked good going into the winter had about 5-6 ‘seams’ of bees when I lifted the crown board … but some of the first bees to take off were big fat drones. Even without seeing them you can hear their distinctive buzz as they fly off clumsily. Something was wrong. It’s still too early for significant numbers of drones to be about in what is turning out to be a late Spring. Sure enough, the first few frames contained ample stores and the frames in the middle of what should be the brood nest had been cleared, cleaned and prepared for the queen to lay in. However, the only brood was a rather pathetic patch of drone cells. Clearly the queen had failed early this season and had become a drone laying queen (DLQ). The brood was in a distinct patch indicating it was a DLQ rather than laying workers which scatter brood all over the frames. There were no young larvae, a few late stage larvae, some sealed brood and a few dozen adult drones. The absence of eggs and young larvae suggested that the queen might have either recently given up or been disposed of. There was even a rather pathetic queen cell, no doubt also containing a drone pupa. I think this colony superseded late last season so the queen would have been unmarked. It also might explain why she was poorly mated. However, a quick but thorough search through the box failed to locate her. I was short of equipment, newspaper and time so shook all the bees off the frames and removed the hive … the hope being that the bees would reorientate to the other hives in the apiary. I tidied things up, made sure the smoker was out and packed away safely and quickly checked the location where the colony had been sited … there was a pretty good sized cluster of bees accumulated on the stand. It was getting cooler and it was clear that the bees were not going to “reorientate to the other hives in the apiary” as I’d hoped. 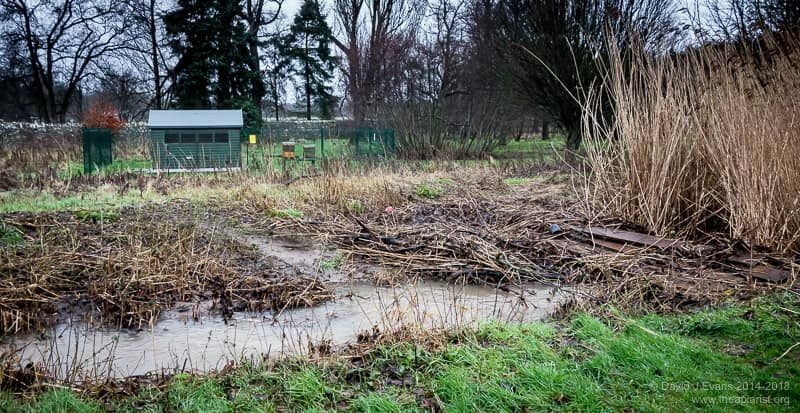 More likely they were going to perish overnight as the temperature was predicted to drop to 3°C. I never think it’s worth mollycoddling weak or failing (failed?) colonies in the Spring as they’re unlikely to do well enough to get a good crop of honey. However, I also try and avoid simply letting bees perish because of lack of time or preparation on my part. I therefore put a small number of frames – including one of stores – into a poly nuc and placed it on the stand in place of the old hive. Within minutes the bees were streaming in, in much the same way as a swarm shaken out on a sheet enters a hive. I left them to it and rushed back to collect some newspaper. By the time I returned they were all in the poly nuc. Since I still wasn’t certain where the DLQ was, or even if she was still present, I placed a couple of sheets of newspaper across the top of the brood box on a strong colony, held in place with a queen excluder. I made a couple of small tears through the newspaper with the hive tool and then placed the DLQ colony on top. 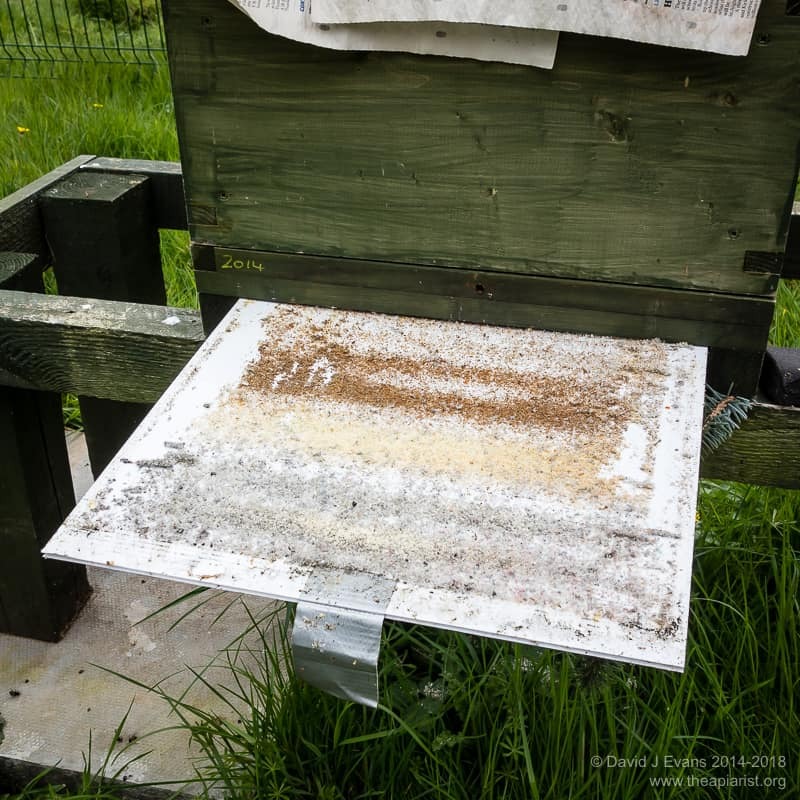 The following day there was lots of activity at the hive entrance and a peek through the perspex crownboard showed that the bees had chewed through a big patch of the newspaper and were now mingling freely. I’ll check again in a few days (it’s getting cold again) and will then remove the top box and shake the remaining bees out – if there’s a queen present (which is pretty unlikely now) she won’t know how to return to the new site. Lessons learned† … firstly, be prepared during early-season inspections for failed queens and have the necessary equipment to hand – newspaper for uniting, a queen excluder etc. Secondly, there’s no need to rush. These bees had been headed by a DLQ for a significant period – going by the numbers of adult drones and small remaining amount of sealed and unsealed drone brood – another day or two wouldn’t make any difference. Rather than shaking them out as the afternoon cooled I’d have been better returning another afternoon with the necessary kit to make the best of a bad situation. I checked another apiary later in the week and discovered another couple of hives with DLQ’s 🙁 In both cases the queen was either unmarked and invisible, or AWOL. If the former they’d have again been supercedure queens as they should have been marked white and clipped from a batch raised and mated in late May/early June last season using a circle split. However, this time I was prepared and united the boxes in the same way over newspaper held down with a queen excluder. All the other colonies I checked were strong. However, these three DLQ colonies – all nominally headed by queens raised last year – are the most I’ve ever had in a single winter and confirm what a poor year 2015 was for queen mating. These three failed colonies – in addition to the presence of variable amounts of drones or drone brood – were also notable for the large amounts of stores still present in the hive. Although it’s been unseasonably cold this April (with regular overnight frosts and strong northerly winds keeping the temperatures – and the beekeepers – depressed) healthy colonies are still building up well, using remaining stores when they can’t get out to forage. As a consequence there’s a real risk of colonies starving. In contrast, colonies with failed queens will be raising little or no brood, so the stores remain unused. Assuming the colony is disease-free these frames can be put aside somewhere safe (and bee proof) for use during preparation of nucs later in the season. This entry was posted in Beekeeping, Queen failure and tagged broadsheet or tabloid, DLQ, newspaper, queen excluder, uniting on April 29, 2016 by David. The graphs above (from the excellent Met Office website) are the rainfall anomaly from the 1981-2010 average, with the darkest blue indicating at least 200% of the average. In contrast, the temperature has been at or above the average, with December being very much warmer (more than 2.5°C above the average, which is 2-4°C). It’s not clear to me whether warm and wet winters benefit either bees or beekeepers. In inclement weather the bees can’t get out to forage – not that there’s much for them to forage on – and the warm temperatures prevent them from clustering tightly. They probably get through their stores more quickly and may continue to raise brood – inevitably this makes midwinter Varroa treatments by trickling or sublimation less effective. On the other hand, there are probably fewer losses of weaker colonies through isolation starvation when it’s too cold for them to move across the frames to the sealed stores. However, my preference would always be for short and cold winters. 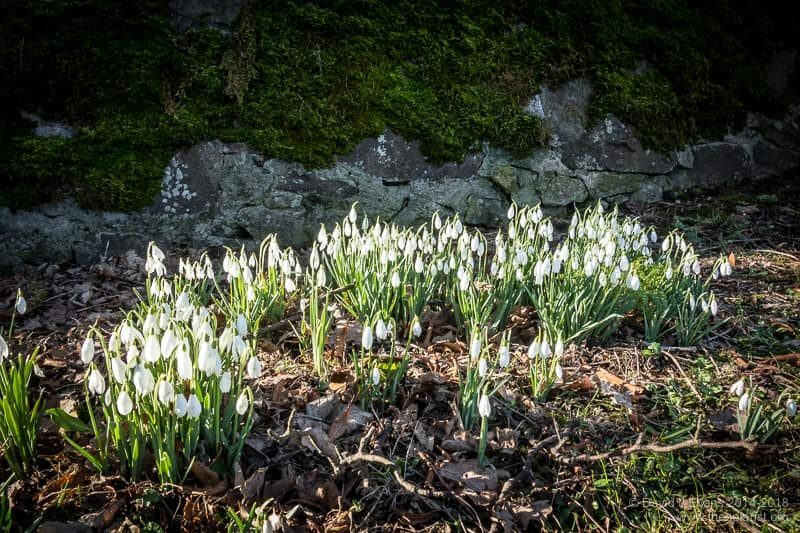 It might sound heartless but I’d prefer weak colonies didn’t survive the winter as they are usually slow starting in the spring and remain unproductive – if they survive at all – through the year. Far better is to realistically assess all colonies in the autumn and unite weak ones with strong ones, boosting the latter and increasing their chances of overwintering successfully. There is no point in uniting weak colonies with other weak colonies, unless you’re stuffing three into one (and the ‘one’ is a strong colony). It shouldn’t be necessary to say it – but I will anyway – if a colony is weak because of overt disease it should not be used to ‘boost’ a strong colony … it’ll do nothing of the sort. Colonies that went into the winter apparently strong, but dwindle rapidly and get significantly weaker may well have dangerously high levels of pathogenic viruses such as deformed wing virus. This might occur if Varroa control was left too late in the season. Anyway, enough discussing stuff that should have been sorted out months ago … the weather is belatedly showing signs of winter, with temperatures below freezing for several nights in a row, a bit of snow here and there, interspersed with some cold, clear days. I’ve not seen a bee venturing out on a cleansing flight for days and the colonies visible under the perspex crownboards are tightly clustered. 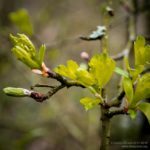 Nevertheless, there are some very obvious signs of spring, with daffodils, snowdrops and celandines flowering, the leaves unfurling on the hawthorn bushes and the willow buds just about breaking. 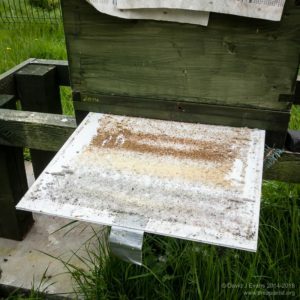 I realise that this is mostly another ‘not beekeeping‘ post, but I thought something slightly easier than the graphs and chemistry of Varroa treatments might be welcome. 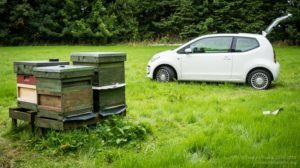 With the season proper fast approaching, now is the time to make plans and to ensure everything is ready for those early season hive inspections. 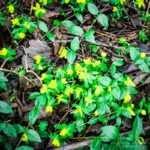 This entry was posted in Beekeeping, Seasonal and tagged climate, Jacques Cousteau, rainfall, Stevie Smith, uniting, Varroa, winter on February 19, 2016 by David. 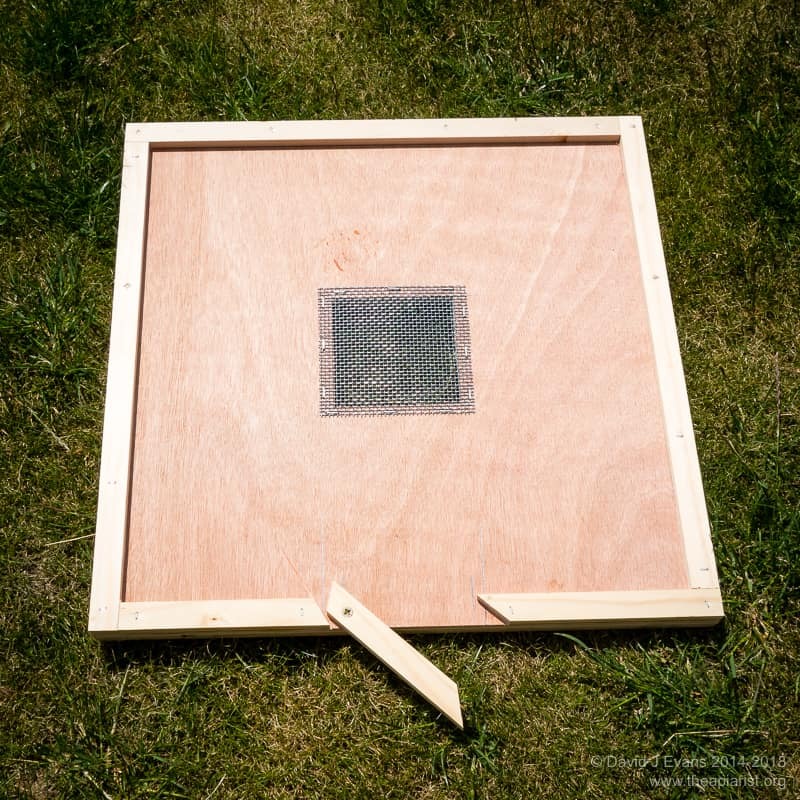 With a perspex crownboard you can detect all of these without disturbing the bees or opening the box. I checked the colonies in one of my apiaries as I’d noticed two that were causing some concern at the final OA vaporisation treatment. One had a good level of stores, but the colony was weak and there were no eggs, larvae or sealed brood. The clipped and marked queen – mated earlier this year – was still present but had clearly failed* and, this late in the season, there was no chance of the colony replacing her. The bees were otherwise fine, with no signs of disease, well tempered and were well worth saving. I disposed of the queen and united them over newspaper with a strong colony on a nearby hive stand. In a few days I’ll put a clearer board under the upper brood box, then rearrange the frames of stores to leave the remaining box packed. Any spare frames of stores – and there should be at least half a dozen – will be used to boost other colonies. Of course, I’m not really saving these bees at all. Instead I’m using their potential to strengthen another colony, so maximising the chances of getting the recipient colony through the winter. With no brood of any sort in the colony it’s likely the queen failed at least 3 weeks ago. 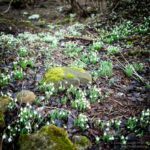 This means that the bees present were unlikely to be ‘winter bees’ and would therefore be expected to perish over the next few weeks. However, in the meantime, they will help strengthen the recipient colony – enhancing it’s ability to raise new brood and increasing the pollen and nectar collected as the season winds down. The second colony was weaker than I’d have liked, but – reassuringly – there were 2-3 frames of brood in all stages, together with an unmarked and unclipped queen. Since all the queens in the apiary were clipped and marked earlier in the season this was clearly a supercedure queen, raised in the last few weeks. The colony was beautifully calm so I gently closed them up. My bee house will be ready soon, so I’ll make sure this colony is one of the first to occupy it. 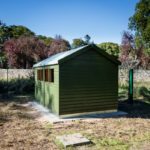 The additional shelter should help them through the winter. With the new queen laying well and the weather set fair for the rest of this week, there’s a good opportunity for the colony to build up before they’re moved. * Remember … some Varroa treatments can cause the queen to stop laying. For example, Apiguard is tolerated by some queens but not others who can stop laying for two or more weeks. The colony with the failed queen (above) had not been treated with Apiguard so I was pretty sure she was a dud. This entry was posted in Beekeeping, Uniting and tagged autumn, queenright, uniting, Varroa on October 1, 2015 by David.